Hey everyone! So we have come to the end of another week. I can't believe that it is already March. This year really is flying by. I have been really slow with my blog lately and I really don't know why. I have been really busy the past month because I have been on work experience and I haven't had time to sit and plan my blog posts in advance like I would normally do. I have also been really struggling with what to write. One of my most popular posts I've ever written has been my 50 Inexpensive Blog Ideas post so you would think I wouldn't struggle again. Wrong. But anyway before I ramble on to much I do obviously have a post for you all so let's get to the point of it! 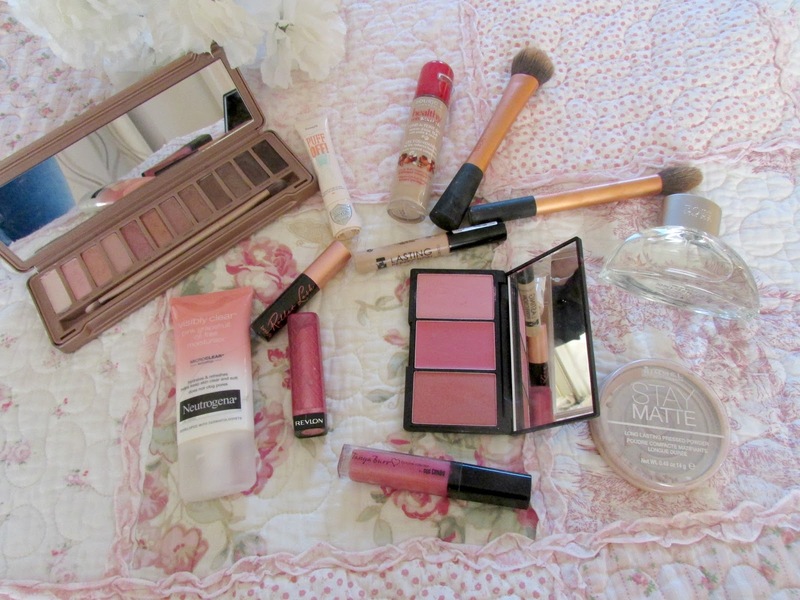 I thought that today I would tell you about my everyday make up. Now when it comes to make up I am not really that fussed. It's one of the main reasons why I changed my blog to lifestyle. I do like make up but I'm not totally and completely in love with it like most other bloggers are there. However it is something I am trying to change as there are some amazing things out there. So here are all the products I use on a daily basis. ENJOY! When it comes to moisturisers I apply a nice lightweight one and then apply an eye cream. Currently I am loving the Neutrogena Pink Grapefruit Oil Free moisturiser. I just think this is such a lovely every day moisturiser. I always apply it first thing in the morning as it feels super refreshing on the skin and the hint of pink grapefruit is definitely something that wakens me up. I also love the way my make up just easily goes on over the top of it. 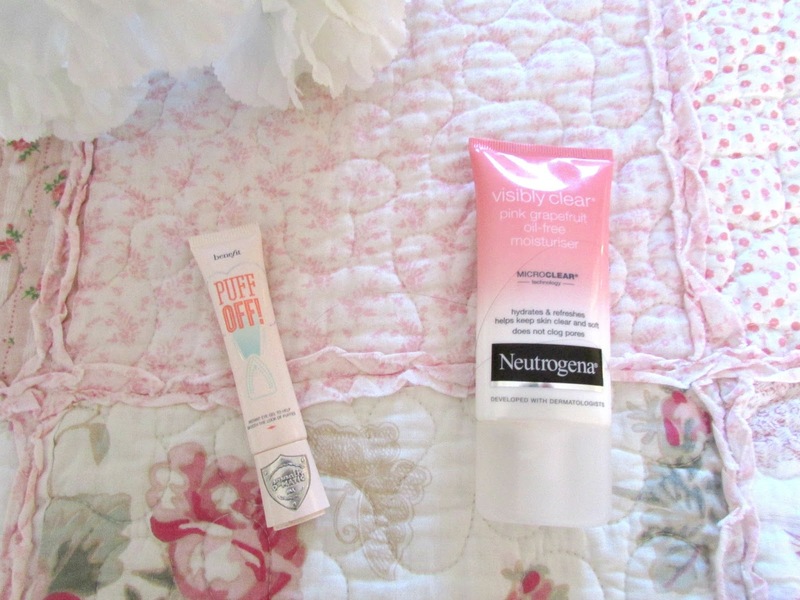 When it comes to eye creams I've been using Benefit's Puff Off eye cream. I love how easy it is to apply concealer of the top of it how refreshing it is under the eyes and how hydrating the cream is as well. I have a full review coming your way soon! Stay tuned. I also put on Benefit's Porefessional over the top of all of this before applying my foundation but I didn't have that on hand to photograph but that really provides a super smooth base and allows my foundation to go on extremely smoothly over the top. Next up is the full face of make up! 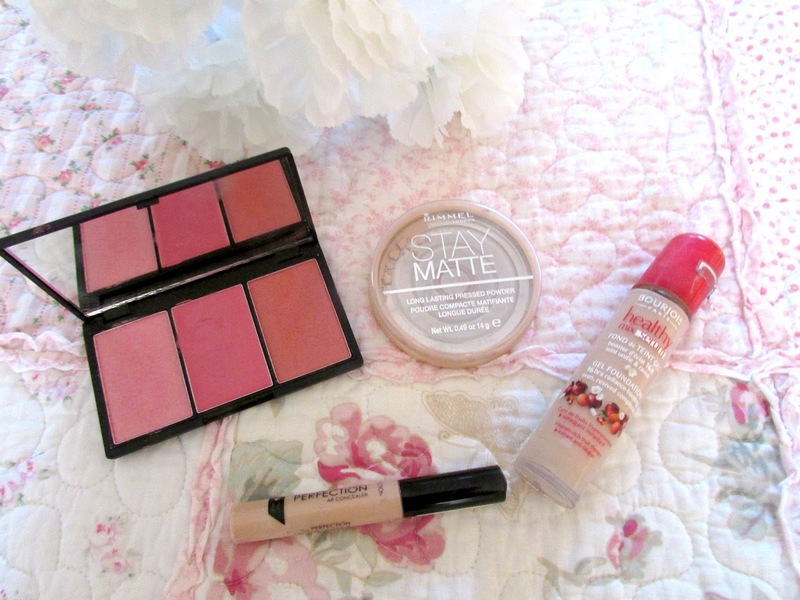 I am obsessed with all of these products as I am sure you all know as I've featured them numerous times on my blog. My all time favorite foundation is the Bourjois Healthy Mix Serum and I wear the shade 53. I just love this foundation so much. It's so easily to apply, leaves an absolutely flawless finish and I just love the gel like texture to it as well. I then apply my concealer (sometimes I do this before foundation, other times I do it after) and I have been using the Collection Lasting Perfection Concealer religiously. I can't remember the last time I bought another brand. I love using this under my eyes and to hide blemishes. It is just incredible. Highly recommended. I am however looking for a brightening concealer (I don't like the Rimmel Wake Me Up) so recommendations are welcome! I then finish off with powder and blush. My all time favorite powder (And I am so proud I've finished off this one before purchasing another) is the Rimmel Stay Matte. It's just incredible. I do prefer the more dewy look to my skin, however this powder is incredible for reducing shine and keeping my make up in place all day. I just love it so much! Forever my holy grail product! I then apply my favourite sleek blush, Icing Sugar from Sleek's 'Pink Lemonade' palette. I absolutely love this shade. It really suits my skin tone and leaves that flushed look on my cheeks which I love. It's a beautiful blush. I then move on to lips where I stick to very simple shades. I love using my lips but better colours if you know what I mean. If I am just staying at home or not doing much I will just buff the dead skin off my lips using the lush lip scrub and then apply the Nuxe Rev De Miel lip balm, if I am heading out I'll just put on a layer of Tanya Burr's lip gloss in the shade 'Smile Dream & Sparkle'. If I'm going to work or out I'll then pick from one of two shades. 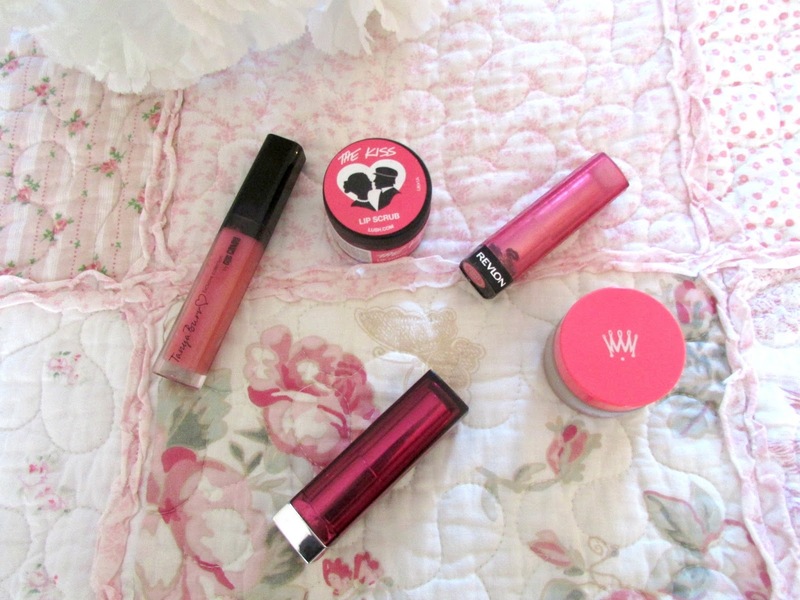 My favourite to wear is the Revlon lip butter in the shade Berry Smoothie. Or for a bit more pop of colour I'll apply the colour sensational lipstick in the shade Stellar Pink which is a gorgeous shade and then that is my lips done! Once the face is done I then move on to eyes and recently I've been loving using the Naked 3 palette. This is probably the only eye shadow palette I use if I'm honest. I just love all the colours in it and they all really compliment my skin tone as well. I change my combination all the time with the colors in these palettes but you'd barely notice I was wearing eye shadow as I tend to keep it to the bare minimum. I then finish off with eyeliner (which I have finished so couldn't photograph sorry) and then some mascara. The one I'm currently loving is Benefit's Roller Lash which is just so incredible. I've been after a mascara for ages that really curls my lashes and allows that really pretty fluttery look and this ticks all the boxes. I'm yet to purchase the full size but I'd highly recommend it. Yes I know these brushes both need cleaning from this morning and yesterday's make up but I love them so much. The buffing brush is amazing for applying foundation as it just gives such a flawless finish and really allows me to buff and blend the foundation into my skin. I use the contour brush for blending my concealer as I just find this does an amazing job. I obviously use more brushes but they were in the sink at the time ready for washing. Once my face is done, hair is done and I'm all suited and booted for the day I apply some perfume and the two I am loving at the moment is Hugo Boss Women and the Police perfume too. 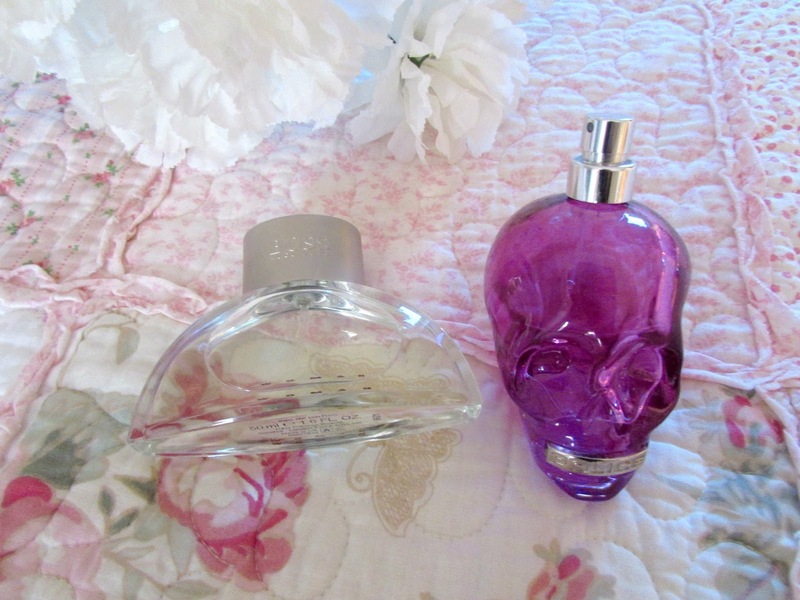 They both smell incredible. I'd highly recommend them. So there we have it! My everyday make up. I know it's not a lot but I like the really natural yet made an effort look if you know what I mean and I believe these products produce those exact results. I'll end this post here before I end up sounding like I am in a science lab! I'll hopefully have a post going up these weekend so make sure to keep an eye on my twitter and instagram (both xbellefleurx to know when I post and also follow me on bloglovin' HERE to never miss a post. Also if you read my blog quite a lot or follow me on twitter and would like me to write about something or if there's anything you would like to see on my blog please let me know in the comments. I would really appreciate it! What's your every day make up routine? 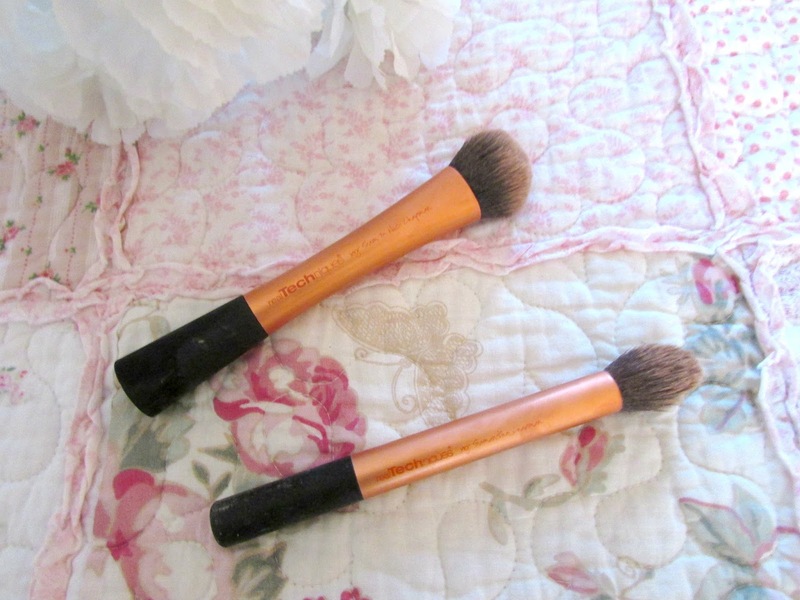 I love the lasting perfection concealer and the expert face brush! 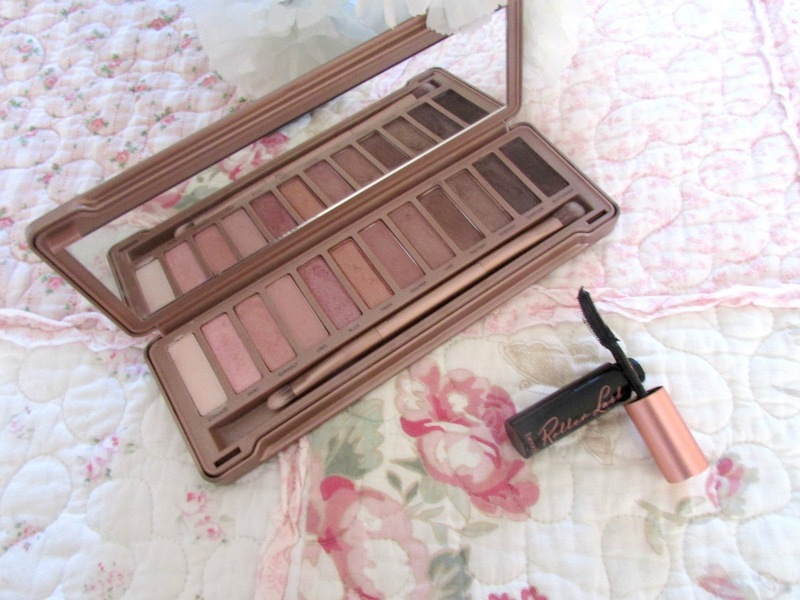 Really like the look of the sleek palette too such pretty colours! I've been meaning to try out the Stay Matte powder, It looks great! It seems like everyone has been loving the Benefit roller lash mascara (including me), like you said, it's incredible!